Open Sew. 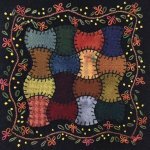 Want to work on wool techniques with your friends and fellow wool lovers? This is the group for you. Bring your project and come on by. The cost is $3.00, payable in the classroom at the start of the class. See you there! Open Sew. 3PM - 7PM. Make some new friends by joining this fun group. Work on your own projects or just sit and visit. No need to preregister. Cost is $3.00, payable in the classroom when you arrive. Open Sew. Group meets from 10AM - 4PM. You must pre-register and pay either online or in the store prior to class. There is no instructor, but there IS lots of experience sitting around the table that you can draw from. Bring your machine (or not, if you're hand sewing), your sewing supplies, your project(s), and of course yourself. 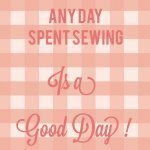 Sit and Sew for a few hours - count 'em - 7 hours of non-stop sewing that you can schedule for yourself! What a treat! Please bring your own lunch. Open Sew. 3PM - 7PM. Join this great group of quilters as they work on their own projects in a relaxed, friendly atmosphere. Have a question or need help? Chances are there will be years of experience in the classroom to help guide you. We take turns volunteering to make a dessert for our fellow class members to enjoy. The class fee is $3.00, collected in the classroom during the Open Sew. No need to sign up or preregister, just come on in and sew with us. Come join the group and explore the World of Tilda. Meeting once a month for a gathering of friends that love exquisite fabrics, beautiful and cute projects, in a party atmosphere. Each month's meeting will highlight a featured project with a kit available. So bring your sewing machine and participate in a fun and delightful day. This group meets the second Wednesday of each month. Cost is $3.00 per person, payable at the group meeting.